Yet another picture of the massive ice-over of Austin. This one of a rosemary bush near my office. 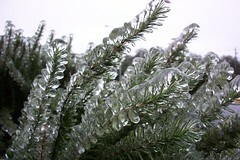 Virtually everything was covered with a half inch or more of ice. As of this morning (Thursday Jan 18th) it’s all beginning to come off. Makes a great sound as you walk around. Everything is crumbling… slowly.